Well, it looks like Brooklyn Beckham had a really great Christmas. He loves to live his life through his extremely popular Instagram channel and we love him for it. This Christmas, Brooklyn got his 'sweet revenge' on his daddy David, who always seems to love upstaging and teasing his son. 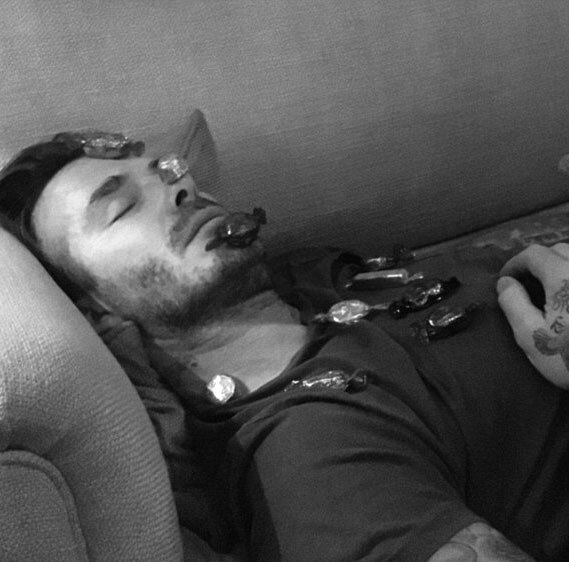 Well, when David Beckham fell asleep on the sofa, Brooklyn seized his chance to embarrass his dad and decided to cover his face with Quality Street chocolates. He then proceeded to take a picture of his dad's chocolate-covered face and post it to his Instagram account, of course. And the result you ask yourselves? Well, Instagram nearly melted with excitement and David seemed to take it all in good spirits. We suspect that revenge will be on the way though, and revenge is 'sweet' as they say. Also in the Beckham news are Brooklyn's lovely brothers, Romeo Romeo and Cruz, who were spotted zooming around a Christmas ice skating rink with daddy David. Cruz seemed to be a real natural on the ice, spinning around and almost managing a pirouette of sorts. Now, when we recently went ice skating at our local garden centre, the ice skating rink was completely packed, and yet when the Beckhams take to the ice, they pretty much get the entire skating rink to themselves. Funny that! And David captioned his picture with the simple words 'Boys will be boys'. It's no secret that David Beckham loves his pie and mash, and recently on a flight to the US he arranged for his favourite pie and mash to be delivered to the plane at the reported cost of £1,000. We wonder whether or not Brooklyn has the same simple, yet expensive tastes as his fathers. Other funny Instagram pictures featuring Brooklyn this Christmas include Golden Boards posing with an elf in Santa's grotto while wearing a Givenchy sweatshirt with the logo 'I Feel Love'. The whole Beckham family also posed for a group picture in a frosty, winter wonderland, where Brooklyn seemed to tower over his mum and dad, although David and Victoria were standing at the back of the picture, so perhaps they're not as short in real life as they looked on the photo.